HomeElectric vehiclesEnvironmentHuman PoweredRenewable energyTransportVehicleWill Our Future Car Follow the ‘Barbagallo X01’ Electric Bike Concept? Will Our Future Car Follow the ‘Barbagallo X01’ Electric Bike Concept? An emphasis for riding a bicycle for a shorter travel in urban jungle provides you a fossil fuel free journey without hampering our environment. In fact, cycling is a lifestyle for many people due to various reasons as it gives pleasure and keeps you fit. Every day, we find news about new innovations in design and concept of a large spectrum of bicycles across the world. That’s sound good as people now understand the effect of pollution on climate and started using the vehicle that powered either by the human or renewable source of energy. To boost the new concept of safe and stylish eco-friendly vehicle, an architect Giorgio R. G. Barbagallo from barbagallo-bikecars, designed and developed a fabulous bike ‘Barbagallo X01’. The crowd funding campaign of Barbagallo X01 is currently underway at Indiegogo for a goal of €80,000. An electro-assisted velomobile bike can achieve a range of 70 km at the max speed of 25 km/h, is really very astonishing and designed on the concept of dream cars. The Barbagallo X01 weighs only 55 kg, is innovatively designed and built by hand 95% recyclable. It’s made of a wooden monocoque coated carbon fiber and body is finished with a high-quality automotive film. It has a renewable energy source; a 120 Watt flexible photovoltaic panel is mounted on the top of waterproof polycarbonate cover! The power range of the new series of Enecom modules goes from 90 Wp to 120 Wp. The high efficient Lithium iron phosphate (LiFeP04) battery, charges in appx. 4 hours, is configured in rear hub wheels. Some unique features include suspensions, hydraulic disc brakes, bigger luggage compartment, removable battery, smartphone connectivity for navigation, integrated hands-free, music connected to a quadraphonic system and more. 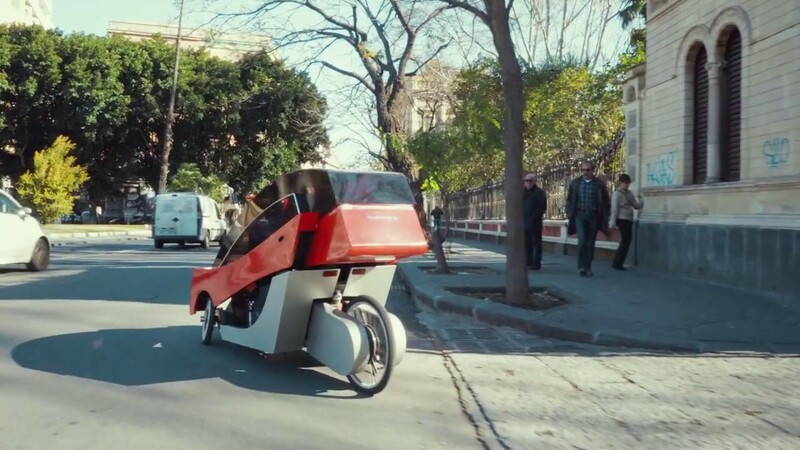 It combines the advantages of the bicycle pedal assistance and absence of harmful emissions, noise, fuel and driver's license, registration, insurance, maintenance and problems with parking in urban areas.